Though New York has the country’s fourth-largest Cuban population, authentic Cuban food is, curiously, hard to find. You’ll stumble across plenty of poseurs and disappointments in your search for the great medianoche (Cuban sandwich), black bean soup or natilla, the traditional cinnamon custard. Luckily, there’s Havana Central (22 East 17th Street), a lively Chelsea hangout. As hip-swaying bachata and sensuous salsa play in the background, you could make a feast of fried sweet plantains, rice and red beans alone. But don’t miss out on the barbecued ribs slathered with mango ginger habañero sauce ($12.95-19.95) or — success! — the classic Cuban sandwich, a grilled mess of ham, roasted pork, pickles and cheese ($6.95), called medianoche because it was originally conceived as a midnight snack. Wash this all down with soothing Guanabana nectar ($2). Though you’ll fill every crevice of your stomach, you’ll find yourself trying to get in a few more bites before rolling out the door. If you’re in the mood for a romantic atmosphere with jazz undertones, head to Cubana Café in Greenwich Village (110 Thompson St.). Seconds after the salty roast pork ($9) grazed my tongue, I found myself eating the delicate yellow rice and soft brown beans to tone down the flavor, and to give my cholesterol a break. The Jarrito soda ($2) was an excellent accompaniment, bursting with sweet natural mandarin flavor. The restaurant’s most unfortunate feature is lack of space. Take the spot an inch from the door and you’ll not only get the same kiddie-sized table as everyone else, but also be interrupted by every arriving customer. (Admittedly, I liked the food so much that I didn’t care about being near the door). 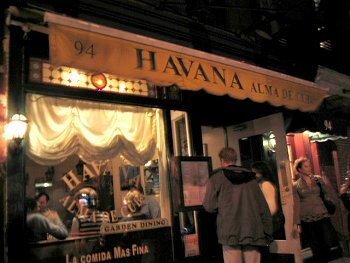 For a more formal atmosphere, visit Havana Alma de Cuba, also in Greenwich Village (94 Christopher St.), where reservations are recommended. Dive into the papas rellenas (fried potatoes stuffed with ground beef and grated cheese, $5) that melt on your tongue, and tender and sweet ropa vieja (shredded steak and mashed plantains, $16). Throw in a little Sangria and a clap-along to a live performance, and you’ll have yourself a night out on the town. The meal at Café Habana (17 Prince Street) wasn’t bad, for a Latin restaurant in very-un-Latin Soho. It’s tricked out as a kitschy diner, and is another cramped spot, though it attracts couples. The one-page menu is at times mistranslated, so it’s good to know some Spanish if you’d like to figure out what you’re really eating. My steak was succulent, but accompanied by flavorless yellow rice and unimpressive red beans. My companion’s slivers of roast pork were pretty juicy, though they seemed dry and gummy at first. The odd signature dish: grilled corn on the cob, strangely smothered in butter, Parmesan cheese, and cayenne pepper. If that sounds good to you, you’ll probably like this place. Don’t bother with midtown poseurs like Azucar, a new place near Columbus Circle (939 8th Ave.). Despite the elaborate décor and atmosphere — palm ceiling fans, white tablecloths, Guayabera-clad waiters marching past colorful murals of Cuban natives — the place lacks real savoir faire. The pollo criollo ($16) was acceptable, but the place spends more time keeping up appearances than producing magnificent food. No one stepped forward play the two lonely congas on the corner stage. Indeed, there was no live music at all; very late at night, a DJ finally appeared.